The last one for now. Back to the US again, a 4 tub pickle car. This is a distinctive freight car from the steam era. This has been on my shop for a few hours, and has already sold one set of 3. No more freight cars for a bit now. What I am planning on working on next is a dummy US diesel body shell. Dummy in that it can not be powered (too small for the current range of powered chassis), but will need to be propelled by a powered boxcar or similar. As always, if you want any of these models in a different number other that 1 or 3 then just ask and I will see what I can do. Also if you have any ideas for other rolling stock you are needing then again just ask, it may be I have already has some ideas about the same vehicle and have started planning how I would create it, in which case it may not take long to complete it. I had been planning on an update, even though I do not really have anything dramatic to report, just to put some traffic on the forum which seemed all quiet again for a week or so. However in the last few days the number of posts seems to have picked up again. That being said, what I have been up to is placing a couple of orders. 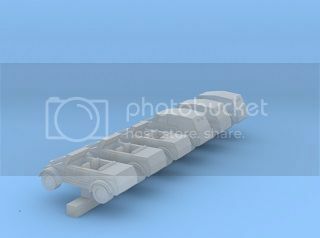 I have ordered a selection of my own models from Shapeways to build up my rolling stock collection. The only new item here is a road vehicle - I will see if this prints successfully or not before showing it here. My other order was for electronic components. I had been developing a pulse width modulation (PWM) controller runing from an Arduino. The coding has been done for some time, but not having a motor driver it is currently just in 'test mode' varying the brightness of an LED rather that driving a loco. Hopefully when this order arrives I will be able to complete it. The design I came up with harks back the H&M Duette controller which I have used for many years in the larger scale, i.e. a nice rotary control operating as centre off. I have built some constants into the program (values that do not normally change, but can be altered during testing). The first is the amount of revolution of the potentiometer either side of centre that is regarded as being off - the old duette has a positive click stop for off, but the one I am using does not so needs a clearer indication. Also I have a constant for the minimum voltage which will start the motor - to avoid having to turn it even more to then get something moving - which will be set on a trial and error basis. My design also has 3 other LEDS for off, left and right so that I can see what should be happening. Hopefully I will have another update when I have received and painted my rolling stock, or have completed a working controller. The batch of models I printed also included some more of the latest rolling stock that I have designed (and that are already in my shop), I plan to get these painted very soon and in place on their chassis. Once done I will get some photos uploaded. I have finally got round to photographing some my rolling stock that I have painted and fitted on chassis. Two for now, with a couple more to come soon. First up is the Nuclear Flask Wagon. I painted this with Vallejo acrylics (my paint of choice for Shapeways FUD) and used an adjustable chassis. Secondly, quick trip across the atlantic and back in time for a 4 tub pickle car. I have always thought that these car were full of character when I saw them in HO or N, and am pleased that they worked out very well in T.
Finally a quick view on how I fit the adjustable chassis to these wagons. I believe that the recommended method of cutting according to the instructions is to cut the chassis from the other end. However doing this would still leave it over long for the scale length rolling stock I have designed, therefore I just cut off the long end instead. Separating and reattaching the bogie/truck works exactly the same, so it is no more difficult overall. Final shot - this is just a TEST! This was another of those where the 3d model was partially complete when I was ready to print a batch of models, and as it was only a few pence extra to add this in it seem daft not to do so just so I could see how it was looking. Currently the model is just plain with no details at all (radiators, chimneys, cab windows, tool boxes, fuel tanks etc), also the cab roof needs raising slightly to correct the proportions. Other than that it does fit perfectly on the chassis - this is of course a dummy model, the hood being too narrow to fit the current chassis, so will need to be propelled by a powered boxcar (which I already have, just did not have it to hand for the photo. I have just sent another order off to Shapeways. This was an order I put together quickly whilst it would still qualify for the free postage offer for own designs only, which ended yesterday. In the batch were various assorted items, but for T it included reprints of the Kubelwagens I had printed earlier - these were unchanged except for the simple addition of a painting handle, which I had managed to miss off first time around. I also added an in progress model of a Bedford OWB wartime coach - progressed further than last time, but still not finished! The main thing I was keen to test were T scale 'building kits'. Why do we need kits rather than completed buildings? The only reason for this line of thinking was that I am getting dangerously close to a layout which will need a town, and I thought that it would be easier to create a whole variety of different buildings for the town centre by designing, and then mixing and matching, separate components for front walls, side walls, rear walls and roofs. I will let you know how well this actually works out when my order is delivered. I am dangerously close to being able to show a photo of my layout, which is completed as far as having a complete loop of track. I tried to photograph this with my phone but that did not produce anything worthy of showing, so that will have to wait until I use a proper camera.